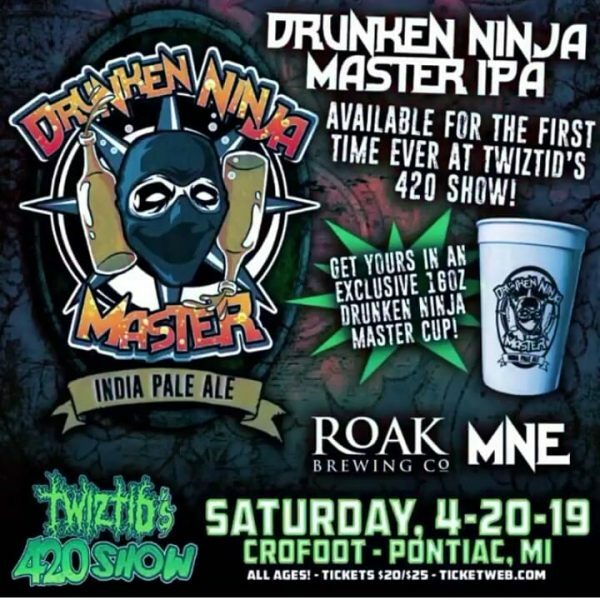 Radio420™: Twiztid’s “Drunken Ninja Master” IPA available on 4/20! Twiztid’s “Drunken Ninja Master” IPA available on 4/20! Several months ago, there was a trademark pending on a new beer called Drunken Ninja Master. We weren’t sure if anything would ever come of it, but it looks like Majik Ninja Entertainment will be releasing their own brand of IPA! It will debut out of the tap at the 420 show taking place in just over a week at The Crofoot in Pontiac, MI! There’s no word yet as to how widely this will be available, but hopefully we’ll see it at some Twiztid/MNE shows in the future! If you haven’t purchased your tickets to the 420 show yet, you can do so at TicketWeb.com!